Which Came First, the Word Chicken or the Word Egg? We shan’t attempt to answer the question in a philosophical or biological manner, but we can answer it lexicographically. And, looking in the Oxford English Dictionary, we can reveal that the answer is … not conclusive. 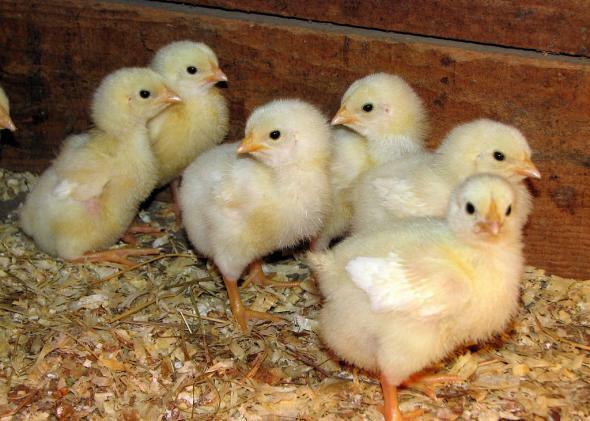 Interestingly, the earliest recorded use of chicken in English refers to the “young of the domestic fowl” in a simile. The word dates to an Old English interlinear gloss of the Lindisfarne Gospels: “Suæ henne somnigas cicceno hire.” This is taken from Matthew 23:37, where Jesus says of Jerusalem that he has “longed to gather your children together as a hen gathers her chicks under her wings” (in the New International Version). In this quotation, chicken is used to describe the young of the fowl, rather than the adult (chicken as a domestic fowl of any age is first found, according to current OED research, as late as the 19th century), but the same verse is also one of the earliest recorded examples of hen (the adult female of the common fowl). All well and good. But we are more interested (for the purposes of this riddle) in egg meaning “the (more or less) spheroidal body produced by the female of birds and other animal species, and containing the germ of a new individual, enclosed within a shell or firm membrane.” Well, this is found in another Old English document: “On æge bið gioleca on middan” (“In an egg there is a yolk in the middle”). Although the egg-as-offspring must predate the egg-as-culinary-fare, we do not know which was written about first. So, when somebody asks you “Which came first, the chicken or the egg?”, you can question what they mean by chicken and what they mean by egg, but you can’t offer a conclusive lexicographical answer; both date from the Old English period, so we’ll call it a draw. It is also worth noting that neither chicken nor egg has yet been revised in the ongoing creation of the third edition of the OED. It’s possible that this question will be resolved when the entries are updated, but for now we can’t be certain. Originally posted on the OxfordWords blog, 10 October 2014. Follow @lexiconvalley on Twitter or on Facebook.